Fast backup software is much more a must than a luxury technology today, specifically for enterprise networks. Fast backup and data recovery are the items of strategical necessity for business: every minute of downtime may cause a notable waste of money. Try Handy Backup, probably the fastest backup app among the truly powerful ones. By eliminating the use of temporary files in favor of the stream archiving, backup performed in new versions of the app has become two or more times faster, without requiring additional storage space and with the reduced memory usage for backup. Increasing of backup and recovery speed takes place even for large volumes of data and when the archiving is involved. Let’s notice some others useful features of awesome product. The app spares both the RAM and physical memory. The fast backup software’s file system is adjusted to the local one on your computer, so you can browse backed up files just like in a file explorer. The featured high speed backup software regards server issues too. To copy and restore your server data there are VSS, network drive backup, fast data recovery remotely, and many other smart options. 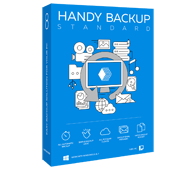 To perform your first really fast backup, try any version of Handy Backup, starting with Home Standard. Set schedule for backup and enjoy automatic fast backup of your computer or other devices! Fast backup software is an ultimate IT efficiency booster for small businesses and enterprises. And those high speed backup and smart features for data security are the what Handy Backup is notably powerful at. Check it out today! Read more: which do the backup job better - Handy Backup or simple backup scripts? Test it out!